I think there's at least one more of these bags that needs to be made by me, I have been using the perfect thrifted packages of fusible fleece for these totes and I have one package left! 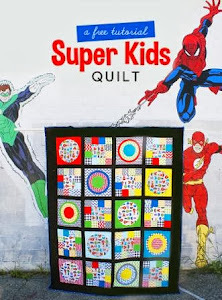 Linking up to Super Online Sewing Community Match at Sew Mama Sew. Pattern for this bag is from the book: Make It, Take It: 16 Cute and Clever Projects to Sew with Friends by Krista Hennebury. The pattern is by Ayumi of Pink Penguin. Sew Organized for the Busy Girl has really inspired me to get my sewing room organized. Time is so much more limited with a new baby and it's embarrassingly true that I waste far too much sewing time looking for things instead of sewing when I get the chance. My habit of buying crafty items at yard sales has not kept pace with using such items and I am now trying to change that! First up, is a big thread wreath. I used to buy any and all thread I came across at yard sales. Sometimes I would use it for sewing but have since learned that very old thread is unreliable within one's projects. It becomes brittle and often dusty, not something you need in your machine. About two years ago, I made this thread wreath with autumn colors. It was finally time to use the rest of my thread stash and make a rainbow one to decorate my sewing room. This thing is heavy, many of the spools are wooden. I love how it came out. When I was pregnant with my daughter, four years ago (! ), I went to Quilt Market and bought this Basic Grey Canvas Sampler at the Sample Spree. I finally put it together over the weekend, adhering fabric scraps via "wonder-under." Choosing the fabrics took an eternity, actually putting the whole thing together was very quick. Once all of the fabrics were placed, I sewed some vintage glass buttons at most of the patchwork intersections. Wooden embroidery hoops are always easy to find and cheap to buy at yard sales. I've stashed these for years and tortured myself by tripping over them as they lay in the corner of my sewing room for months recently. I finally selected a non-traditional rainbow of stash fabrics and put these together as hoop art. I really like how this looks, this picture doesn't do it justice. I will add to it as I find more wooden hoops at yard sales. Eventually I will do a "final reveal" of my sewing room when everything is put together. That may be a while, my next project is to organize my patterns- a mammoth task I'm still not sure how to approach. Hello friends! I hope you are having a good summer so far. Today marks three weeks of my caring for these three on my own since my husband went back to work. Some days are really long and tedious, but the hard days are interspersed with easier ones. It feels like my older kids are demanding a lot more from me. Sneaking in sewing time comes in small chunks, here and there. 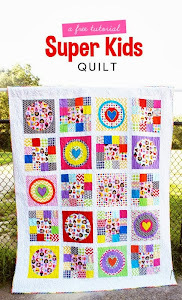 Mini quilts are a great project to use practicing different free motion quilting techniques. In the picture above, you can see I did some free motion cat heads. What a funny term! The highest project on my priority list has been finishing up this baby quilt. The baby shower (that I am hosting!) is being held tomorrow afternoon. Somehow, I made the top and quilted it in a matter of a few days. But it was hand sewing the binding down that took ages. In the past, this step has usually been accomplished in the evenings after children's bedtime but now that I have an infant, all time and energy is focused on him. I finally completed the last edge last night. Phew! I backed the quilt in a large piece of pink Erin McMorris flannel, with a small strip of the yellow colorway on one side. I chose this fabric from my stash in the interest of putting it to good use as well as it was one of my few options that matched the colors of the quilt. Quilting on flannel wasn't too bad, but definitely not as easy as quilting cotton. There's a lot more "drag" with flannel. As I have worked on this quilt, I have wondered if I chose the right amount of dark and light fabrics. Did I really master "value" with this quilt? It's helped me realize that my stash could use more dark fabrics, like that lovely Amy Butler wallflower print and the pink Washi geometric. I am really pleased with the Kona Ash as sashing; it helps the light and dark fabrics pop and will hopefully be more forgiving than white when it comes to stains and wear and tear. This quilt measures 49" square and it is bound in a Patty Young Lush fabric.